Summary: Vivian Daly has lived a quiet life on the coast of Maine, but in her attic, hidden in trunks, are vestiges of a turbulent past. Seventeen-year-old Molly Ayer knows that a community service position helping an elderly woman clean out her home is the only think keeping her out of juvie and worse. As Molly helps Vivian sort through her possessions and memories, she discovers that she and Vivian aren't as different as they appear. A young Irish immigrant orphaned in New York City, Vivian was put on an orphan train to the Midwest, bound for the home of a stranger, with hundreds of other children whose destinies would be determined by luck and chance. Molly, a Penobscot Indian who has spent her youth in and out of foster homes, is also an outsider being raised by strangers, and she, too, has questions about the past. While reading THE CHAPERONE by Laura Moriarty earlier this year, I was introduced to the term "orphan train." If you are like me and unfamiliar with orphan trains, you can learn more about them here. Briefly, there were about 30,000 homeless children in New York City in the 1850s. One man, Charles Loring Brace, the founder of The Children's Aid Society, thought it might be best to remove these children from the city streets and place them in "morally upright" homes. As a result, the orphan trains relocated more than 120,000 children to homes in the Midwest where they lived and worked on farms. It is now considered the beginning of foster-care in the United States. At the time, I was fascinated by the idea of orphan trains and couldn't believe I hadn't run across more novels exploring this topic. 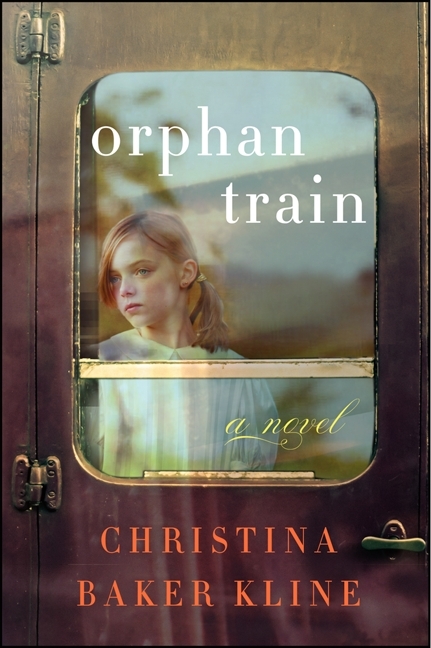 So when I discovered that Christina Baker Kline's new novel ORPHAN TRAIN told the story of a young orphan girl who was transferred from New York City to the Midwest to a new home with strangers, I knew I wanted to read it. Even though the book doesn't come out until April, I was fortunate enough to receive an early copy and wanted to share it with you right away! ORPHAN TRAIN tells the story of two women who have more in common than what first meets the eye. Molly is a troubled teen who is doing community service for Vivian, an elderly woman who lives all alone surrounded by boxes containing mementos from her past. As Molly begins to sort through Vivian's boxes, both women learn that they were orphans who raised by strangers and struggled to fit in. By sharing their stories, they gain an appreciation of each other and forge a special bond of friendship. I thoroughly enjoyed ORPHAN TRAIN, and I can certainly see why so many readers have such wonderful things to say about Ms. Kline's writing. I was very impressed with her storytelling abilities, especially how she went back and forth between the present day and the past. In addition, I appreciated her character development and how she was able to link together Vivian and Molly's characters when initially I thought they had little in common. ORPHAN TRAIN was a wonderful read that entertained me and most definitely touched my heart. One of the best things that I can say about ORPHAN TRAIN is how much this story affected me. While I can't say that I was able to directly relate to either Vivian or Molly, for some reason, these characters really got under my skin... in a good way. I think Ms. Kline's descriptions of both characters' childhoods, namely the abandonment and loneliness aspects, made me want to cry for them; and as a result, I felt fully vested in both of their stories. In particular, I found the details about Vivian's experiences on the orphan train to be utterly heartbreaking. That also goes to show how effective the author was at bringing these events to life! I honestly can't say which story I preferred more -- the present day one or the flashback one. Both stories were very interesting and fit together perfectly. I did enjoy how there were so many parallels in the characters' stories; and I especially liked how Vivian's story offered some much needed hope for Molly. There was a time in Vivian's story where it read a bit like a romance, with star-crossed lovers and a fair amount of coincidence; however, I actually chose to look at it as a beautiful love story. I wanted the characters in this book to find happiness in any way possible! This shouldn't come as a surprise to you, but I think ORPHAN TRAIN would make a fantastic book club selection. The characters are extremely interesting and certainly will generate some discussion; however, there are also some universal themes which might be interesting to talk about. Some of the topics you might want to explore include love, parent/child relationships, forgiveness, second chances, goodbyes, trust, change, and friendship. Truly, I thought ORPHAN TRAIN was an excellent book with very memorable characters; and it certainly showed that friendship can be found in the most unlikely places. Highly recommended! Thanks to The Bookreporter Network for providing a review copy of this novel. This does sound interesting and like a good discussion book. I'm not sure what I think about orphan trains. On one hand it seems nice that the children were able to be with families but on the other, it seems like a cold and heartless way to go about it. I hadn't heard of this book before today. But your review really grabbed my attention. Thanks, Julie! Wow, I had no idea about these trains, but it would be a great discussion book for book club. Thanks. My great grandmother was on a orphan train. I'm glad you posted about this book. I will have to add it to my stack of things to read! I too first learned about orphan trains in The Chaperone. I'm fascinated. I think I should read this one.